145 quiet, comfortable, air conditioned rooms, hot tub rooms, executive rooms, and suites cater to the needs of a weary traveler and busy executive. Our newly constructed West Wing has 54 rooms including 25 suites, a family suite, and a family double. West Wing also has a hot tub and coffee bar. Executive rooms meet your extra needs with a full-size desk, computer and fax outlets, recliner and even a phone in the bathroom. All rooms have free Wireless Internet Access. Try one of our hot tub rooms complete with a wet bar, refrigerator, microwave and king size bed. 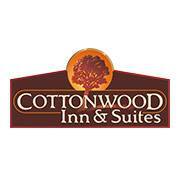 The Cottonwood Inn & Suites has room service, and cable TV with HBO to make your stay even more enjoyable. A guest laundry is available for your convenience as well as refrigerators in most rooms. Each room is equipped with a built-in hair dryer, iron, ironing boards, and coffee makers. Handicapped rooms are available by request. Free High-speed Wireless Internet Access in All Rooms!